North Carolina Recording Artists M16 & The Full Moon Wolves Release New Music Video "#WORK"
Coast 2 Coast Mixtapes announces the release of the new music video by M16 & The Full Moon Wolves currently seeking blog placements and interviews. Today Coast 2 Coast Mixtapes announces the release of "#WORK", the latest music video by North Carolina Hip-Hop group M16 & The Full Moon Wolves. The video can currently be seen in its entirety at the Coast 2 Coast Mixtapes website. M16 & The Full Moon Wolves are currently seeking press opportunities, interviews, features, and more. They can be reached through their official website. ABout M16 & The Full Moon Wolves: M16 & The Full Moon Wolves is a musical band from Durham North Carolina. Music is a catchy way to express your deep feelings. It gives a soul to the universe canvas, wings to the mind, food to the soul, flight to the imagination and life to everything. Words alone cannot articulate what one feels unless put into musical form. Music keeps you high and gives peace to the soul and mind and activates your body. However, music has lost its true meaning and importance. M16 & The Full Moon Wolves is not only a band, but a light of hope for music revival. The band has a vision to deliver meaning and message of life in musical form and restore and revive music. During performance of the band you will experience the energy and excitement. It will make your day a memorable day and touch your heart and soul with the spell of their performance. Moreover, you will be thrilled by listening to the amazing music of the band and will be hooked on to this band. The band is truly out of the crowd, which sets everything in motion. 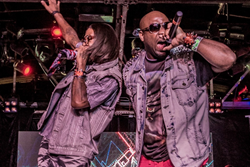 The band implies a blended impression of Linkin Park, Limp Bizkit, and Kid Rock, while the vocal delivery is a supernatural and a pleasant mixture of DMX, Mystikal, Ja Rule, Lenny Kravitz and Busta Rhymes, which altogether creates the ever-present kinetic energy of the Black Eye Peas. This will result in charismatic voice that will rule over people’s hearts.